The man-made chest hair coats provide men one way of regaining their lost machismo. Back in the day, a hairy chest is what a guy needed to feel masculine and appealing, but nowadays society has lost its interest in chest hair in favor of a more pre-pubescent appeal. 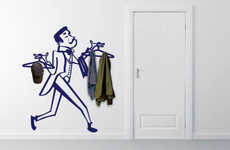 The UK dairy company Arla created the ‘Man-Fur Coats’ as a means to promote its chocolate milk drink for men, Wing-co. The chest hair-made coats were sown from a million strands of male chest hair that took about 200 hours to create—how many guys can say that their coats were probably made from their dad’s chest hair? The dairy company thinks that British men have been emasculated over the years. According to the company, the coat is aimed to make men proud of their physiology. The chest hair coat is priced at $3,900.